Neuromuscular electrical stimulation (NMES or sometimes called “Russian stim”) is an effective way to improve quad activation, but unfortunately it is commonly used incorrectly by clinicians. I say unfortunately because when used incorrectly, it won't provide your patients with its potential benefits and will waste their (and your) time. If you want to skip ahead to the video summarizing how to set NMES up, scroll down towards the end of the article (a written summary is also provided). I don't use modalities on my patients but the one exception I have is using NMES on a patient's quad (I have also tried it out on the infraspinatus and on the gastroc but I didn't find consistent results). The benefits of NMES after ACL reconstruction and knee replacement surgery have been clearly demonstrated in multiple studies - those patients demonstrated better quad strength and improved functional outcomes compared to those who did not receive NMES. 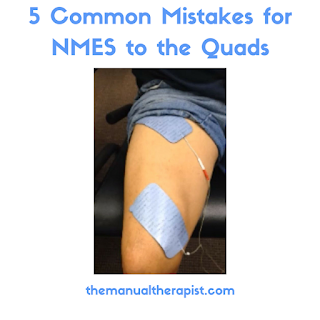 Typically, I use NMES on any patient that has had a significant knee injury/surgery that presents with quad atrophy, difficulty activating their quad, or has weightbearing limitations. NMES is especially useful (and I would almost say mandatory) in anyone who is non-weightbearing. In these NWB patients, NMES tends to be the most stimulus the quad will receive and thus, the most effective option for them to improve muscle activation and prevent/retard atrophy. If you are not using NMES on this patient population, I feel that you are doing a disservice to them as you are not providing them with the most effective treatment strategy. And if it's because you are afraid/unsure how to use it, then this article should help clear things it up and make you feel more confident/comfortable in using it. I didn't know where to include the following statement, but I know someone will ask the question, so I just threw it in here - while I don't necessarily think there is a superior place to put NMES in your treatment plan, I typically use it at the end of a patient's treatment due to its potential to cause muscle fatigue. Most clinicians tend to have their patients in the long-sitting position with the knee fully extended when using NMES and this position will not give you the most effective results. Having the patient seated with the knee in 60° flexion will provide better results as demonstrated by this study. I have found that patients are able to tolerate a higher stim intensity in the 60° position and I think because it’s more uncomfortable to have your patella pulled straight up towards your hip than to have it compressed into the joint. Another important point to remember is that many times patients don’t have full knee extension yet, so being in the long-sitting position will actually allow their knee to move. If you have a Biodex unit in your clinic, that is the easiest way to achieve the 60° isometric position. If not, have the patient sit in the knee extension machine, secure their shin to the machine so their knee is in 60° of knee flexion, and then set the weight-stack to the heaviest setting (so it won't move). I commonly see clinicians using electrodes that they use for TENS and this will not work when trying to use NMES. The electrodes should be much larger than ones typically used for TENS – I like to use 3” x 5” rectangular electrodes (I have used oval ones before too). You need a larger electrode due to the amount of current that will be going through them - larger pads make it more comfortable for the patient. If you try to put all that current through a smaller electrode, the patient won’t be able to tolerate it. The proper electrode placement is one over the distal quad/VMO area (and yes I’m fully aware that you can’t selectively activate the VMO and I hate when clinicians say someone needs to strengthen their VMO) and the other electrode should go over the quad’s proximal motor point. The location of the motor point varies between individuals, but if you are using the proper size electrode (see above) and place it in the proximal quad area, there’s a good chance you’ll catch it. Many times I’ll see the two electrodes placed a few inches apart over the distal quad area and this won’t give you good results. Only the muscle between the two electrodes will be stimulated, so by placing them far apart you will stimulate a larger amount of muscle. And if you are over the motor point, then you will get even more activation (with less intensity needed). This is probably the most common mistake I see clinicians make – not turning up the intensity enough to elicit a tetanic muscle contraction. If you don’t get a tetanic contraction, your patient won’t be reaping the benefits of NMES and you will be wasting their time. There are two ways that I think help you achieve adequate intensity of the sitm. First, you need to use the proper electrode size (as I mentioned above). If you don’t, then you won’t be able to turn the intensity up high enough. Second, is to make sure you provide proper, thorough patient education on what NMES is/does. You have to describe to the patient exactly what they will feel, why NMES is so beneficial, and that if they don’t like it to just say “stop” and you’ll turn it off. I will actually give my patients the hand-held unit I use and show them where the “off” button is if they want to stop it – I don’t think I have had anyone ever actually do this though. I will also stick around for the first couple contractions so I can talk them about it and answer any questions. Usually the first couple contractions are the most uncomfortable and then the patient gets used to it. If for any reason a patient feels pain or if they can't tolerate enough intensity to elicit a good quad contraction, I won't use it (maybe you can revisit it later on). When I use NMES on my patients, I prefer to use the the Empi 300PV unit. However, I don’t think they make this unit anymore and I’m not sure what they replaced it with – maybe someone can tell me what they replaced it with or another handheld unit that produces effective results.